For most tasks in the kitchen, all you really need is a chef knife to get the job done. There are other types of knives that will do a better job for the task at hand though. Utilizing the best carving knife or slicing knife can really be a game changer. These types of knives are used to cut large portions of meat and roasts efficiently. While you could use a chef knife to do most of your carving and slicing, a carving or slicing knife will help you to execute accurate cuts on larger portions. Although carving knives and slicing knives are sometimes interchangeable, they are really designed for specific tasks. The slicing knife is more like an oversized fillet knife. The blade is very flexible and the edge usually has excellent blade retention. The blade is also usually pitted all the way down to help release juices and pressure while slicing through dense meat. This helps make a cleaner and even cut through the meat. The end of the blade is also rounded to help prevent any unnecessary piercing of the meat. Carving knives are more similar to a chef knife in the construction sense. The knife has the overall same construction but the blade is usually longer and the depth is usually thinner. The blade can also sometimes be pitted to aide in making precise cuts as well. A slicing knife is used to cut cold deli meats, bread, pastries, baked hams and roasts. Here is a video to show you how to use a slicing knife properly. A carving knife is used for carving while turkeys, chickens, barbeque brisket and other meats on the bone just like a boning knife. Both of these knives can do the same jobs, it just depends on what you are comfortable with using. In this article, we will cover what you will need to know when purchasing a slicing or carving knife. We will also cover some of the top models available for purchase on the market today to better help you to make a decision on which to buy. Choosing the best carving or slicing knife is no different than choosing any other knife. You, of course, want the absolute best quality of materials and construction available. Choosing which knife to buy will be a little bit more involved. You will have to determine which aspects of the knife will work the best for you. Just like any other knife, you will want to have a solid build to ensure the knife will not only last forever but also live up to its potential. The basic wants and needs for both knives are the same. You will want to have a handle on the knife that is comfortable in your hand. Also, a full tang that retreats into the handle, mounted with 3 or more rivets will ensure the knife will last a long time. This also adds quite a bit of added durability. Excellent edge retention goes without saying for every knife but more so with a slicing knife. The blade is usually very thin and similar to a fillet knife which makes the blade very flexible. This helps with cutting around the bone and on larger portions of meat. Learn more about edge retention. A pitted blade will help to make sure the cuts are evener. This isn’t absolutely necessary, but this design does help in the long run. A knife that has been made of a higher carbon content within the stainless steel will make the blade more flexible and able to hold a sharper edge over time. 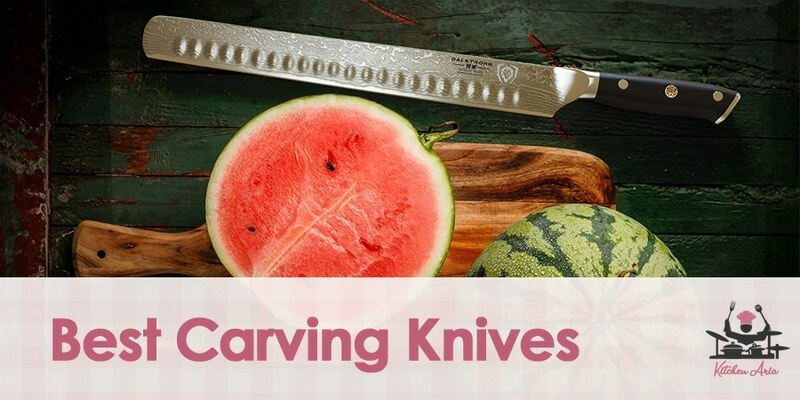 However, if you plan on doing a lot of carving and slicing, you should go with a lower carbon content stainless steel to ensure the strength and durability of the knife will last. Many knives come with different accessories, more so the carving and slicing knives. For these knives, it would be necessary to have a case or sheath to store the knife in. These types of knives are not used every day and must be stored properly and safely. A case or sheath will help to protect the knife until further use is needed. Other great accessories that go hand in hand with carving and slicing knives would be a sharpening stone or steel or a carving fork. A carving fork is usually part of the set when buying a carving knife. They are used to hold the roast or larger portion in place while carving or slicing off portions. A sharpening steel is also helpful for these types of knives. Most will hold an edge fairly well, but it is not uncommon to sharpen the knife every time before use, because they are not used that often. Our first knife comes from a very well-known knife maker which has been making knives longer than just about anyone else. This company uses a higher carbon stainless steel to ensure durability and overall toughness of the knife. This knife will definitely be the power house of carving knives meant to be used for larger quantities of food. The knife is constructed beautifully with a full tang and triple rivets which help to strengthen the knife. The synthetic handle is pressed against the tang and held by the rivets. It also has an agronomical shape to fit comfortably in your hand when slicing or carving. The blade has an excellent retention grade of 55 on the Rockwell scale and will not need to be sharpened all that often. The length of the blade is also pitted to help make more accurate and precise cuts. This model also comes with a double-pronged carving knife which shares all the same constructive qualities as the knife. A carving knife will come in handy when using this knife. This slicing knife is an actual thing of beauty. The knife has been constructed to mimic the Damascus steel design of pressed steel on the blade. The Blade itself is made from a high carbon stainless steel that has been vacuum treated with 66 layers of pressed steel to give it that cool look. The edge of the blade also has excellent retention with a staggering grade of 66+ on the Rockwell scale, so you know it’s crazy sharp. The blade is an extra-long 12 inches to help cut through any large piece of meat. The blade also has a full tang which is held together with a very nice handle which is impervious to heat, cold and moisture. The handle is held against the full tang with 3 rivets so it is very durable. The blade is also pitted to help the release of airflow and make precisely even cuts all the way down. The knife also comes with a padded sheath for storing when not in use as well. This carving knife comes from a company known for making knives for over a century. The knife is constructed of 16 layers of pressed high carbon stainless steel to give it that cool Damascus look and feel. Because of this, the blade has excellent edge retention and will rarely need to be sharpened. The blade has a full tang but no rivets to hold it in place from the handle. The handle is constructed of Pakkawood in a D shape for extra comfort when handling the knife. The blade is a bit shorter than most carving knives coming in at 8 inches as well. This German made knife is a little bit of the best of both worlds. Most German knives are usually made of a low carbon steel while this one is made of a higher carbon steel. The higher carbon stainless steel allows the knife to be more flexible and thinner. This gives the blade excellent blade retention and a nice score of 55+ on the Rockwell scale. You won’t be needing to sharpen this knife anytime soon. The blade also has a full tang and is pressed between a synthetic polymer handle that is held together by three rivets for extra strength within the knife. This knife is probably not the best choice of slicing knives considering its build. This knife would work better in a commercial kitchen where many people would be handling the knife all day. The blade is an extra-long 12 inches and is pitted to help the release of air and juices for more even cuts. While the blade is on the cheaper side of most slicing knives, it does lack a lot of special features you would want in a meat slicer. This is a beautiful set anyone would love to have. This carving knife and carving fork were designed specifically for culinary students learning to cook. The blade is made from low carbon stainless steel which makes the knife very strong and able to be sharpened very easily. The blade is also pitted to help with the release of air and juices while cutting through larger portions of meat and vegetables. The blade has an extended full tang with a forged bolster for easy handling. The handle is made from Pakkawood and is held on by 3 rivets and polished to give a nice clean look. This knife also comes with a beautiful two-pronged carving fork which makes handling larger portions of meat easier to cut. This slicing knife is very similar to the other Dalstrong knife above, but this is the less expensive and lower quality knife. While it has all the same qualities, we mentioned from the other Dalstrong slicing knife, the only difference from this one is the actual construction of the blade. The blade is made from the high carbon stainless steel but with only 12 layers of pressed steel which makes the knife a bit thicker. The knife has good blade retention with a score of 53+ on the Rockwell scale. The knife also comes with a padded sheath for storing the knife when not in use. This slicing knife is kind of an oddball. Global is known for making knives in one solid piece, including the handle which is made of metal as well. This slicing knife is much thinner than most traditional slicing knives at ½ inch in thickness. The handle is also an extension on the actual blade itself and is pitted to help prevent slipping when handling. This knife is not like most knives you would use in a kitchen and we do not recommend just anyone using it. This knife may be the best option for the money. It has a lot of the valuable features you want in a carving knife without breaking the bank in the long run. The blade is constructed of low carbon stainless steel which makes the knife very strong but will lack in edge retention. The knife also has a full tang that is pressed between a synthetic polymer handle which is held together by three rivets for added balance. Whether you are planning on carving a turkey on Thanksgiving, slicing a Holiday ham at Christmas or just carving brisket at your next backyard barbeque, you can be sure that any of these knives will do you justice.